JSR began its business in petrochemicals, a sector built on synthetic rubber. From there, it expanded to the information electronics materials sector; namely, semiconductor materials and display materials. It subsequently moved into the life sciences, environment, and energy sectors, through which it has given the world numerous highly functional materials developed with its own technologies. What has supported these advancements has been JSR's substantial research and development framework. 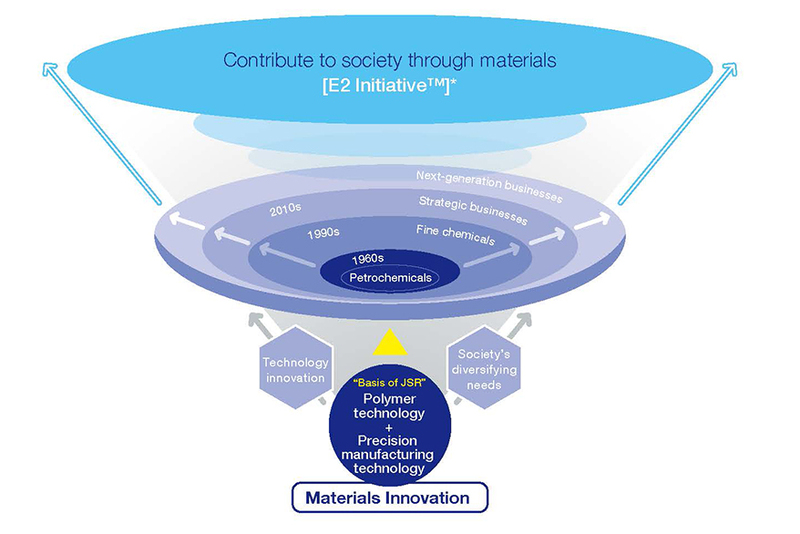 At the present time, JSR's R&D bases include five research laboratories established in the Yokkaichi Research Center (the Performance Polymer Research Laboratories, the Display Solution Research Laboratories, the Fine Electronic Materials Research Laboratories, Advanced Materials Research Laboratories, and the Edge Computing Research Laboratories) as well as the Tsukuba Research Laboratories, the JSR Functional Materials Research Center (established within the Molecular Engineering Institute of Kinki University), and the JSR-Keio University Medical and Chemical Innovation Center (JKiC; established at the Shinanomachi Campus of Keio University). JSR's Research and Development Department is responsible for supporting existing businesses and creating new businesses. To fulfill these roles, it works closely across related organizations to (1) set research themes that anticipate market needs and (2) build and strengthen a flexible research system that is highly responsive to customer demand. It also conducts joint research with customers, universities, and research institutes in highly innovative basic and exploratory research areas. JSR understands that R&D outcomes will determine its future success. This is why it is not only aggressively improving its core polymer technologies but also moving into new fields by integrating its work in polymers with discoveries in fields like photochemistry, inorganic chemistry, precision processing, and biotechnology.